Asiatsäure ist eine organisch chemische Verbindungen aus der Gruppe der pentacyclischen Triterpene (Ursantyp) und wurde erstmals aus dem Indischer Wassernabel Centella asiatica (auch: Tigergras, Gotu Kola, Pegagan; synonym: Hydrocotyle asiatica) isoliert und danach benannt. 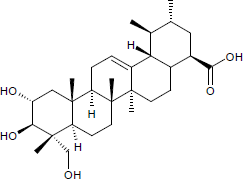 In Pflanzen tritt der Naturstoff meist glykosidisch gebunden als Asiatikosid auf. Die Asiatsäure findet unter der INCI-Bezeichnung Asiatic acid Anwendung als hautpflegendes, die Beständigkeit und Haltbarkeit stabilisierendes Mittel in Kosmetika. Synthesis and Biological Evaluation of Asiatic Acid Derivatives as Inhibitors of Glycogen Phosphorylases. Chemistry & Biodiversity, (2009), DOI 10.1002/cbdv.200800092. Spectroscopic Studies on the Interaction of Asiatic Acid with Bovine Serum Albumin. Chinese Journal of Chemistry, (2011), DOI 10.1002/cjoc.201190121. Unraveling the binding mechanism of asiatic acid with human serum albumin and its biological implications. Journal of Biomolecular Structure and Dynamics, (2013), DOI 10.1080/07391102.2013.817953. Green Extraction: Enhanced Extraction Yield of Asiatic Acid from Centella asiatica (L.) Nanopowders. Journal of Applied Chemistry, (2013), DOI 10.1155/2013/460168.